Al Hartmann | Tribune file photo Tundra swans stretch in a line for several miles at the Bear River Migratory Bird Refuge west of Brigham City. Tundra Swan Day this year is March 9 at the refuge. Al Hartmann | Tribune file photo Juvenile tundra swans with their first-year plumage swim in between adults at the Bear River Migratory Bird Refuge west of Brigham City. Tundra Swan Day this year is March 9 at the refuge. Al Hartmann | Tribune file photo Tundra swans gather at the Bear River Migratory Bird Refuge west of Brigham City. Tundra Swan Day this year is March 9 at the refuge. Al Hartmann | Tribune file photo Tundra swans gather at the Bear River Migratory Bird Refuge west of Brigham City. Tundra Swan Day this year is March 9 at the Bear River Migratory Bird Refuge. Al Hartmann | Tribune file photo A flock of tundra swans flies over Salt Creek Waterfowl Managment Area south of Tremonton. Tundra Swan Day this year is March 9 at the Bear River Migratory Bird Refuge. Al Hartmann | Tribune file photo A flock of tundra swans takes off from Salt Creek Waterfowl Managment Area south of Tremonton. Tundra Swan Day this year is March 9 at the Bear River Migratory Bird Refuge. Al Hartmann | Tribune file photo Tundra swans gather at Salt Creek Waterfowl Managment Area south of Tremonton. Tundra Swan Day this year is March 9 at the Bear River Migratory Bird Refuge. Al Hartmann | Tribune file photo A flock of tundra swans flies over Salt Creek Waterfowl Managment Area south of Tremonton. Tundra Swan Day this year is March 9 at the Bear River Migratory Bird Refuge. Al Hartmann | Tribune file photo Juvenile tundra swans with their first year plumage swim in between adults at the Bear River Migratory Bird Refuge west of Brigham City. Tundra Swan Day this year is March 9 at the refuge. 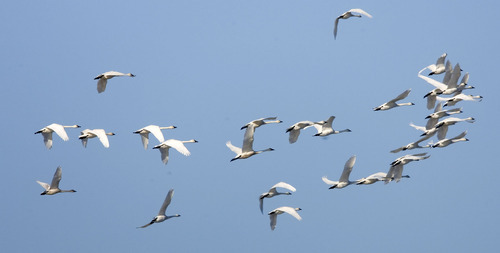 Al Hartmann | Tribune file photo Flock of tundra swans fly over Salt Creek Waterfowl Managment Area south of Tremonton. Tundra Swan Day is March 9 at the Bear River Migratory Bird Refuge. Swans are not only reserved for children&apos;s books and exclusive resort ponds. An average of 40,000 tundra swans migrate twice annually through Utah on their 3,500-mile commute between the Arctic tundra and southern California. The large birds, weighing up to 25 pounds and sporting a wing-span of 5½ feet as adults, head south in the fall and make the return trip each spring. Federal and state wildlife agencies celebrate the spring migration by holding Swan Day viewing events. The Bear River Migratory Bird Refuge, run by the U.S. Fish and Wildlife Service, is holding Swan Day from 10 a.m. to 3 p.m. March 9. Free activities at the refuge Wildlife Education Center, 2155 W. Forest St., in Brigham City include: youth activities and crafts related to tundra swans; Junior Ranger activities; book readings; photo presentations; a swan biology clinic; and a Junior Duck Stamp starter kit handout. Visitors will also be able to drive the refuge tour auto loop and stop to chat with naturalists to spot and hear tundra swans. 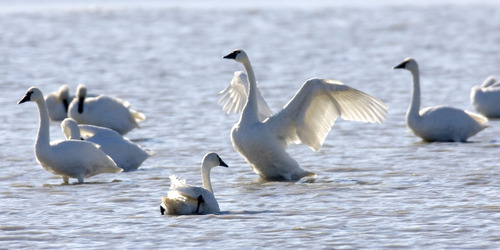 Biologists from the Utah Division of Wildlife Resources (DWR) will be holding Swan Day on March 16 at two locations: Farmington Bay Waterfowl Management Area west of Farmington and the Salt Creek Waterfowl Management Area west of Corinne. DWR employees will be at each site from 9 a.m. to 3 p.m. and will have spotting scopes available for visitors to get a good look at the swans.